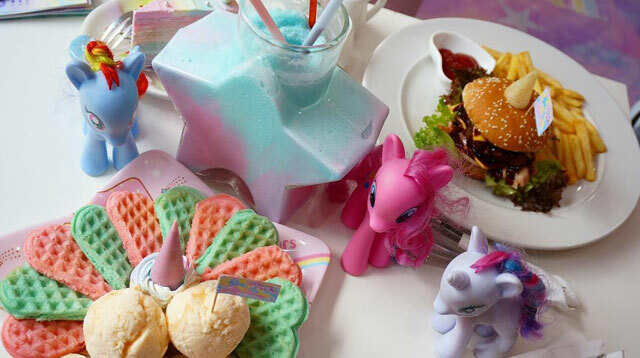 Everything on the menu is a unicorn at this dreamy Bangkok café. Should you find yourself near Bangkok, Thailand, you'll want to stop by the Unicorn Café, where life is rainbows and unicorns — literally. The interior of the cafe looks like a pastel explosion fashioned by Lisa Frank on her most manic day. There's unicorn wallpaper, unicorn carpet, unicorn statues, powder blue and pink furniture, and unicorn dolls and toys everywhere. Oh, and there are unicorn onesies you can wear while you're there too. The Unicorn Café menu goes just as hard on the unicorn theme, with rainbow-colored spaghetti carbonara, unicorn burgers with french fry horns, and frozen rainbow ombré galaxy drinks. You can eat your meal without the company of the many My Little Pony toys at the café, or you can have them stare at your food while you 'gram and eat. Who else is ready to book a flight to Thailand?